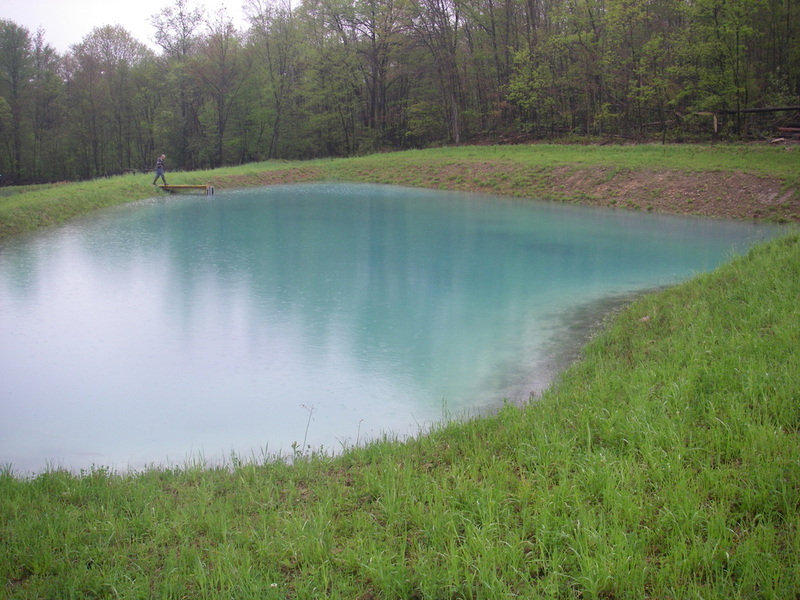 Vertical Flow Ponds (VFP) or Successive Alkalinity Producing Systems (SAPS) – This treatment pond is for water that has a low pH and dissolved iron and aluminum. The idea is to raise the pH of the water without the iron separating as a solid in the treatment pond. Therefore, the dissolved oxygen must be used up in the water before the pH can be increased. In this system water flows from the discharge to a pond that has a layer of compost followed by a layer of limestone with a set of drainage pipes on the bottom. Compost is a mixture of decaying material such as leaves or manure. When something breaks down after dying, it uses oxygen. As the water flows through the compost, the oxygen is used up by the decaying material. After that the water flows through the limestone which increases the pH above 3.5. Then, when the water flows out from the pipe at the bottom of the system into a settling pond it comes in contact with the air. This provides the two conditions that are needed for iron to form a solid: a pH above 3.5 and exposure to oxygen. Once the iron has separated as a solid from the water, it falls to the bottom of the settling pond, where it is unable to reach the stream and cause pollution. Another benefit of these VFP systems is that they typically create an excess of alkalinity that is carried by the water into the stream and helps to neutralize other acidic inputs. Anoxic Limestone Drain (ALD) – This type of treatment system is for an AMD discharge that contains iron but no dissolved aluminum or oxygen. In this type of system, water must be collected by a pipe inside the mine and conveyed to the ALD before it comes in contact with the air. This is to prevent the iron from forming as a solid. For this type of system a trench is dug and lined with heavy plastic. Limestone is placed in the trench and the plastic is wrapped around like a burrito and then covered with clay soil. All of this is to prevent air from entering the system. Hence the term “anoxic”, which means “without oxygen”. If no oxygen is present, the limestone in the ALD will increase the alkalinity and boost the pH to above 3.5. The iron will not form a solid until after it exits into a settling pond and comes in contact with the air. 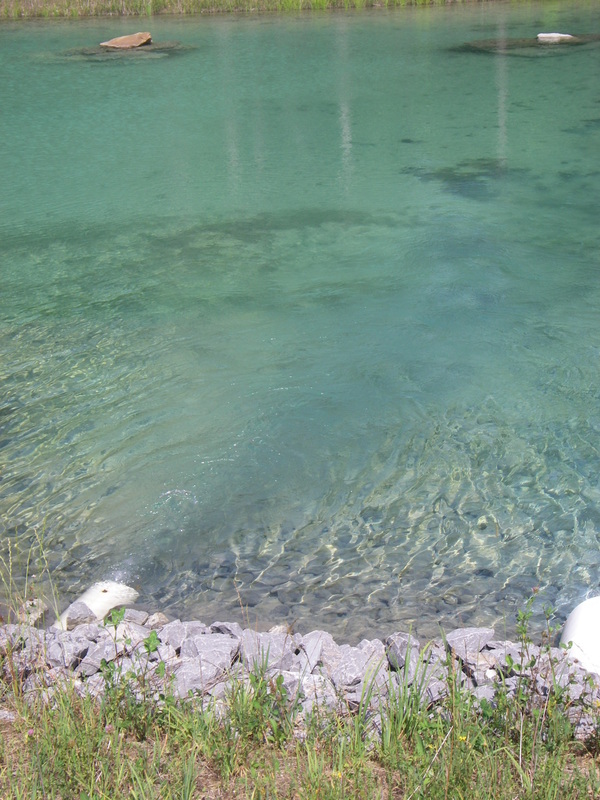 Limestone Ponds – This type of treatment is best for an AMD discharge with a low pH that contains dissolved aluminum. The goal of this system is to raise the pH to allow the aluminum to separate as a solid. For this type of system, a pond is dug and filled with limestone. 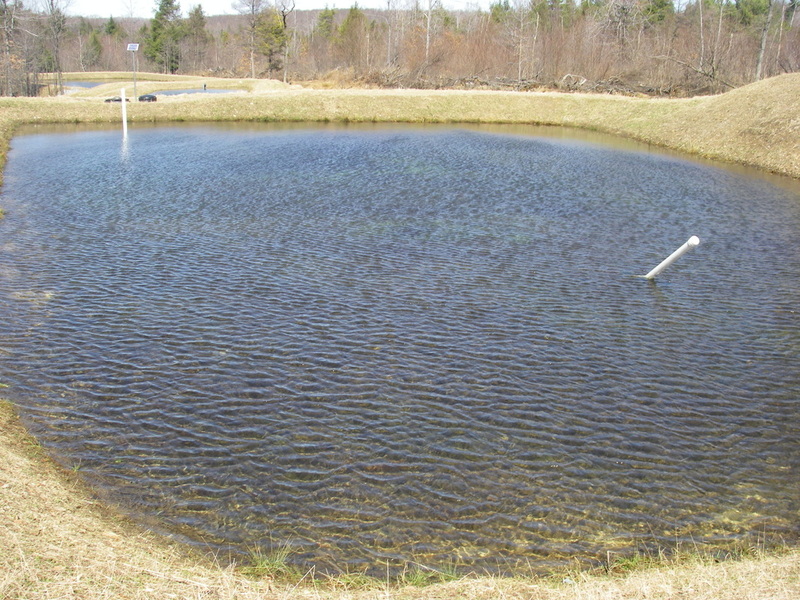 Water from the discharge flows into the pond through the limestone and exits out from a pipe at the bottom of the pond. The limestone increases the pH of the water above 5.0-5.5. This allows the aluminum to separate as a solid. As the water exits, it flows into a settling pond where the aluminum settles on the bottom. 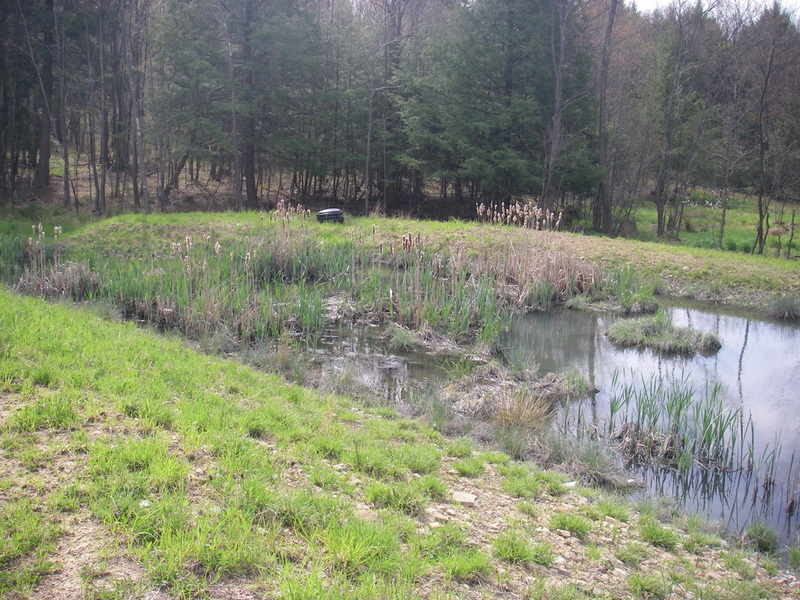 Settling Ponds and Polishing Wetlands – The goal of these are to provide a place for the metals that have separated as solids to settle out of the water. They are found after every treatment pond. They act as a place to hold the harmful metals and prevent them from reaching the stream, where they would normally cause harm to fish and other aquatic life. Flushing – All of these treatment systems need to be flushed or drained down periodically. These ponds are built so that water is allowed to build up to a certain level, like a dam. Then, the blockage is removed (like putting a hole in a dam) and the water rushes out. All these ponds have pipes on the bottom with holes to allow the water to flow through them. All of these pipes flow to one common outlet. At the outlet the level of the water in the pond is backed up to a certain height by the use of boards in a metal box. To flush a pond the boards are removed. This causes all the backed up water to quickly exit the pipe. As the water is quickly leaving, the iron and aluminum solids that may have built up in the limestone are “flushed” out with the water. This helps prevent the limestone from becoming covered with solids and keeps the spaces between the rocks open so that the water can move through. Limestone Dosers – These are large metal containers called silos with a bucket on the bottom that can tip back and forth. These silos are typically filled with lime or other alkaline materials. This material will mix with water to raise the pH. Water flows into the bucket and when it reaches a certain level the bucket “tips”. When tipped it causes a predetermined dosage of the lime to fall into the water. The lime increases the alkalinity and the pH of the water. The increase of the pH causes the metals to separate as a solid. Usually a settling pond is built after the doser to serve as a place for these metals to fall to the bottom. The maintenance issues for limestone dosers are more time consuming than passive treatment. It requires dedicated volunteers to make sure the silo is filled when needed. 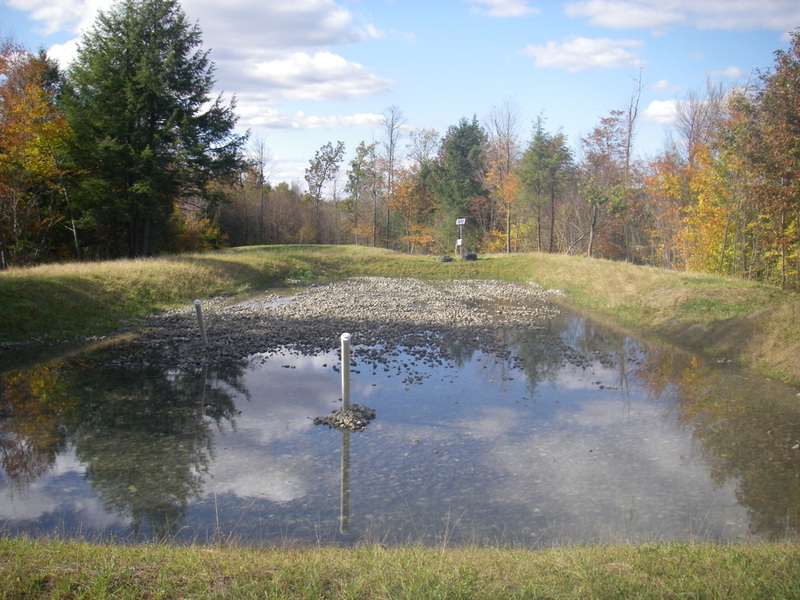 Diversion wells – These are small, concrete tanks that are buried in the ground and are filled with crushed limestone. A dam is built upstream to raise the level of the water and an intake pipe is placed in the stream that flows to the tank. This will increase the force of the water to break up the limestone as it enters the tank. The limestone then dissolves in the water raising the pH and alkalinity. Diversion wells work best in streams that have higher acidity levels (low pH) but with low amounts of metals. The maintenance of a diversion well is more time consuming than passive treatment. It requires a dedicated group willing to visit the wells every 2 weeks or so to add more limestone. Limestone Channels – This type of treatment is used for water that has high levels of acidity but low amounts of dissolved metals. This channel is a rock-lined ditch filled with limestone. As water flows over the limestone, the stone is dissolved adding alkalinity and increasing pH. A steeper channel is preferred as it decreases the chance that any of the metals that have separated out as solids will cover the limestone and reduce the effectiveness at treating the water. Limestone Sanding or Alkaline Sand Addition – This is the addition of very fine limestone into the stream. This limestone is placed on stream banks. When the stream undergoes a high water event, such as after a rain storm, the water flows over the material and carries it into the stream. The limestone dissolves and helps raise pH and increase alkalinity. The maintenance issues associated with limestone sanding are more time consuming than passive treatment. Sanding requires a dedicated group willing to visit the site and add more limestone sand when needed.